It is with honor that we at the Daily Rock Report Louisville Rock & Metal Hall of Fame announce our very first inductee, Bobby Burns, the driven, and musically clever mastermind, visionary and founder of PRIMER 55. 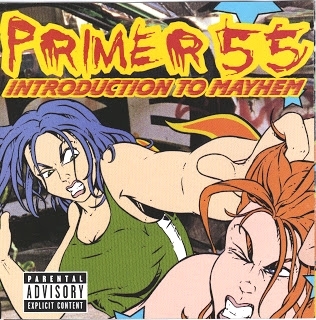 Released January 25, 2000 by Island Records, Primer 55’s debut, ‘Introduction To Mayhem’ has proven to leave an eternal stamp in modern music history, maintaining staying power among fans with songs such as ‘Loose’, ‘ Freak Love’, ‘Dose’, ‘Set It Off’, ‘The Big F**k You’, and other groove metal hybrid based cutting edge tunes carefully and uniquely arranged by Burns. 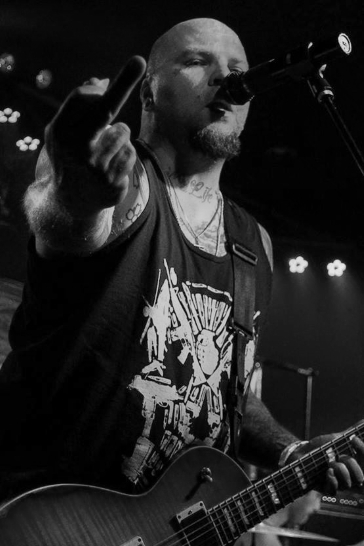 The album is permanently embedded into hard rock and metal history having been sort of an “Introduction” to the 2000’s portion of the then rising alternative metal / Nu-Metal revolution. Led by Bobby, with the swagger of some sort of musical modern alter-ego of General George S. Patton, the music of Primer 55 provided a flare to the industry. His vision of ideas melted and stirred into a soulful mixing pot of punk, metal, hip-hop with a powerful element of body twitching groove that listeners of the genre simply could not deny. Not just some dime-a-dozen guitar player, Burns knows his way around the mixing knobs, wrinkles and pockets of the recording studio due to the fact that he has a superior ear packaged with a strong vision. Primer 55’s sophomore effort, (The) New Release, dropped on August 14, 2001, peaking at #1 on the Billboard Heatseekers chart, and #102 on the Billboard 200. The single ‘This Life’, peaked at #37 on Mainstream Rock Tracks. In 2003 Bobby would join forces with metal heavyweights SOULFLY, accepting an offer to fill the role of bassist, a gig that many well-known metal bass players would have begged, clawed and killed for just for a secure shot to play with one of the most relevant metal musicians of all time, Max Cavalera. Soulfly released four studio albums with Burns over the course of seven years. An admirable feat of mental and physical endurance for anyone working with Max Cavalera, and his managing wife Gloria. The couple has developed a sort of reputation among industry insiders as being difficult to deal with. Just ask Max’s former Brazilian band mates SEPULTURA. When Max and Gloria left them behind after feuding over power struggles, Max even left his brother, Igor Cavalera behind. A bit ironic for a guy being all about “family”. So where does Bobby Burns get his unstoppable determination to keep pushing forward with all he has? There is this little theory I have, called the Muhammad Ali Effect. The story goes, and in my opinion, is one of truth, that after the Cassius Clay (who would later change his name to Muhammad Ali), returned to the city of Louisville after winning the World Olympic Gold Metal for Heavyweights, representing our country and planting the seed for what would grow into something much larger than just simply being a boy from Louisville. Ali, after giving the USA a reason to swagger, especially his hometown, walked into a local eatery in the downtown Louisville area, Gold Medal around his neck, and was told that “Colored’s were not allowed, despite being a National Sports Hero. He probably did not even consider the thought of being barred, Louisville was already a much more evolved melting pot and known for its racial relations, which became a model for many cities, and every south of the Ohio. Ali was furious, the Gold Medal, in his mind had been reduced to nothing more than a chunk of worthless scrap metal. He walked onto the Second Street bridge, feeling defeated as he walked along the walkway, and angrily feeling defeated, tossed the Gold Medal into the Ohio River. He would go on to never give up ever again. To give all he had for what he believed. In a bout with millions of Americans calling him a traitor, facing prison, he pressed on. He would not bow down, he told the world, someone would have to kill him. They didn’t. Ali, now a long time sufferer of Parkinson’s disease, has not let that deter him still to this very day. In recent years, I personally have seen him in attendance at several University of Louisville sporting events, representing his city. He never gave up on Louisville or himself. Somewhere lodged deeply in the sediment of the Ohio River is something nearly as symbolic, which transcends any one life and is responsible for being the source of unlimited hope and determination. The Holy Grail of the Ohio River. Those living in the city drink the tapped water and live off of it. Call me crazy, call me what you will, THE GREATNESS is within an incredible number of local natives and citizens. Many who are iconic and world-famous. I personally cite the great Gonzo journalist Hunter S. Thompson, my literary hero, as a prime example. 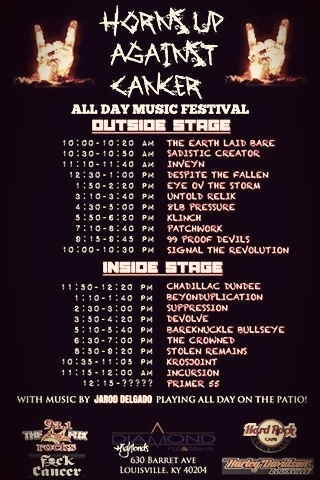 Those living in the Louisville, Kentucky area will have a chance to see PRIMER 55 on September 19, 2015 at a cancer research funding event called ‘HORNS UP AGAINST CANCER’. with all proceeds funding the well-established ‘F**K CANCER FOUNDATION’. It just may be the bands final show ever, “or at least, the last Primer 55 show for a very long time” Burns said recently stating that new vision, with a new direction have emerged from the mind of the musical genius.